We’ve been hard at work over the last few months working on our newest version of BillingServ. It’s been a lot of hard work, V1 and V2 are completely different systems. As you may know we decided to rebuild BillingServ V2 from the ground up. We have learnt from our mistakes, lack of scalability and features. BillingServ V2 has grown up to be a much superior product. We are proud of what we’ve built, BillingServ V2 performs more quickly, is easier to use and provides a truly hassle-free experience. You can now send an invoice to a client in under 30 seconds, receive payments earlier and have access to better accounting. Lots of changes have been happening here. We’ve hired a new team of developers to speed up development, we’ve been working towards our ISO 27001 and have become GDPR Compliant. Within the next couple of weeks, we will be releasing our importer for our clients currently on V1. Once we’ve released our importer you will be able to import all your clients, products, invoices and settings into V2. This has taken longer than we originally thought. A lot of hard work has gone into our systems to make sure everything is smooth as possible for our clients. Once you’ve swapped over to your brand new BillingServ V2 platform, you will have noticed everything is completely different. In terms of looks, speed and features. We wanted to make sure V2 could be used by any business in any sector. BillingServ is no longer just a web hosting billing platform. I want to promise you that we will never stop developing our product. We will always make sure we are building features that will make running your business smoother and simpler. 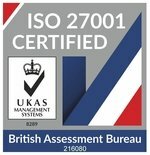 Just one more thing, working towards our ISO 27001 helps us to make sure we are always secure and complaint, making sure our clients data is safe at all times. Keep an eye on this blog and website, as I will be keeping you updated on our progress. Thank you for sticking with us, the wait will be worth it. Jordan & the BillingServ Team. Previous ArticleBillingServ Wins Rising Star and Great User Experience Awards in FinancesOnline.com ReviewNext ArticleISO 27001, BillingServ V2 & New Updates.